Home » News » Election 2018 » Are Voter ID Laws the New Poll Tax? WASHINGTON — As more states move to pass strict voter ID laws, cries of voter suppression have grown louder. But that’s not really new: Voter suppression in the U.S. is as old as the nation itself. From the beginning, white women and enslaved black people were barred from the polls. After the Civil War and Emancipation, free black men began to vote, but new barriers were erected, despite passage of the 15th Amendment granting them that right. In 1876, the U.S. Supreme Court ruled that Congress lacked jurisdiction to regulate state and local elections. This allowed states, specifically Southern states, to enact policies that hindered blacks from voting as the Reconstruction Era came to an end. Literacy tests would be given during voter registration. In what seemed to be an innocent exercise, black potential voters had to decipher complicated state constitutions whereas their white counterparts were given the equivalent of childhood readings. Furthermore, grandfather clauses exempted people from literacy tests who had been able to vote at the end of the Civil War. That demographic was exclusively white and male. 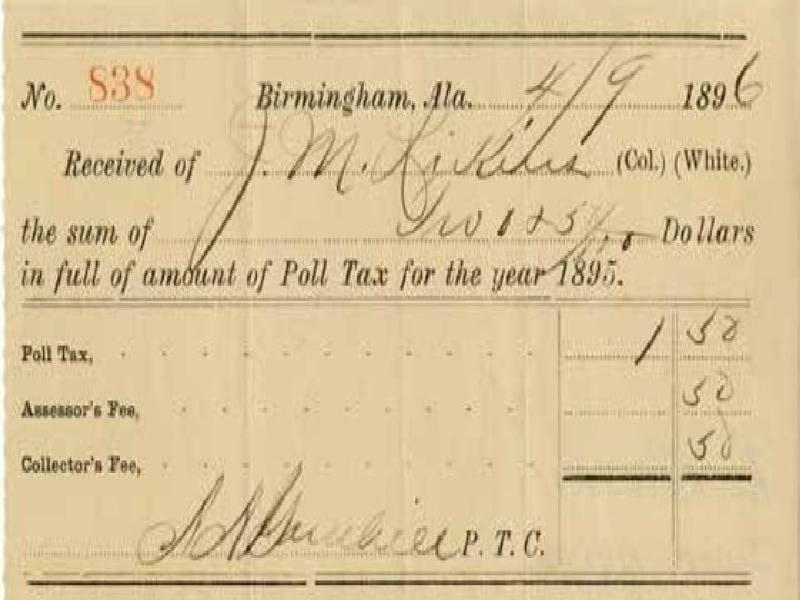 Poll taxes were another method used to bar the poor and minorities from voting. These were fees that states charged citizens to be able to vote. Today, many states have enacted voter ID laws, some more strict than others. Obtaining identification suitable for polling stations can sometimes be a costly and difficult feat — especially for black voters. Is this the new poll tax? With Barack Obama’s presidential candidacy in 2008 and his re-election in 2012, a wave of states began to ramp up stringent photo ID laws for voters. Laws of this nature disproportionately reduce the votes of racial and ethnic minorities, who are less likely to have the necessary ID. Reasons for minorities not having identification include the fact that they are less likely to drive and more likely to live farther from state agencies that issue IDs. Minorities also are more likely to have difficulty obtaining their birth certificates or Social Security cards. Laws that reduce the number of minority voters means a likely reduction of votes for Democratic Party candidates, because minorities tend to lean left politically. The Brennan Center for Justice found that up to 25 percent of African-American citizens of voting age lack a government-issued photo ID, compared with 8 percent of whites. Some legislators argued that more stringent ID laws would prevent in-person voter fraud. However, a report done by the Washington Post in 2014 found only 31 incidents of voter fraud between the years 2000 and 2014. A total of 1 billion votes was cast during this time frame, the report said. Thirty-four states have identification requirements at the polls. Seven of these states have strict photo ID laws. In Georgia, for example, potential voters must have identification issued by Georgia or the military or provide a U.S. passport. In comparison, California’s ID laws allow first-time voters to bring in any state ID, a debit card or even a health club ID. If you are not a first-time voter in California, you do not need to provide identification at the polls. States also tend to exclude forms of ID in a manner that works against black voters. In Texas, a student ID is not acceptable but a license to carry a handgun is — and research has show that black people are less likely to be gun-owners. Until 2013, North Carolina prohibited public assistance IDs and state employee ID cards, which are disproportionately held by black voters, according to the American Civil Liberties Union. In 2014, the U.S. Government Accountability Office (GAO) released a study that analyzed voter turnout based on ID requirements during the 2008 and 2012 general elections. The GAO found that states that implemented stricter ID laws had a significantly lower voter turnout than comparison states that did not have changes in their ID requirements. Truth be told, yes, voter ID laws have been shown to suppress the votes of minorities, low-income citizens and students.